LAST WEEK a west Penwith man said he encountered an unidentified flying object in the sky. Peter Macnally, who lives close to Rosudgeon, said he and his wife spotted the oddity on Friday at around 5.30pm. He said he is “perplexed” and wonders if they are the only people to have seen it. Mr Macnally described his experience: “I saw a very bright light in the sky. “At first I thought it was Venus but there were no stars. “It was definitely man-made. 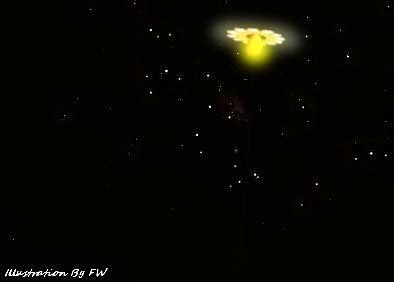 There were two parts - the upper part was a large disc with a cluster of yellow/white lights. Beneath it was an illuminated shape. “It was very visible, due south from Trevean for about ten minutes before being obscured by heavy cloud.” . . .